M’lady did not care for The Selling, at all. She thought it was corny and childish. Total amateur hour. Long pointless scenes. An unfunny comedy. For the most part, I agreed with her, and still do—yet I quite liked it. Apparently, girls not only mature faster than boys, they mature far longer. Does that make sense? The truth is, The Selling is nothing more than an old-fashioned spook-house comedy, a genre that peaked somewhere around the time of The Ghost and Mr. Chicken. And my inner 12-year-old (which greatly resembles my outer 50-year-old), was delighted. I giggled like a mental patient all the way through it. M’lady thinks me deranged, or at least a case for arrested development. Maybe deranged development is most accurate. Screenwriter and star Gabriel Diani is dweeby Los Angeles real estate agent Richard Scarry—you know, like the children’s author—who needs to make a pile of dough in a hurry to pay for his mother’s cancer treatment, which, unsurprisingly, is ungodly expensive. Richard and his dopey pal Dave (Jonathan Klein) get talked into buying a murder house by hot/conniving Realtor Mary Best (Janet Varney) and are then forced to somehow fix-up and flip a house that’s haunted by the 12 victims of a serial killer known as the Sleep Stalker. The Selling is at its best in the world of real estate chicanery, as our knucklehead protagonists attempt to get an extremely haunted house ready for a “showing.” Meek little Richard attempts to reason with the ghosts, telling them that he is, in fact, in a rather tight spot, and that has no choice but to try and sell the house. The ghosts respond with a volley of plagues that would have driven saner, smarter men to head for the hills. Richard and Dave are not ghostbusters or even especially competent; they’re just a pair of goofy schnooks that get in over their heads. At least Richard is rewarded with a romantic interest, the extremely bubbly paranormal blogger Ginger Sparks (Etta Divine) who helps them make contact with the spirit world. Comedian Simon Helberg has a small part, and veteran scene chewer Barry Bostwick shows up as a bumbling exorcist. From all accounts, this was a shoe-string operation, financed the friend-and-family way. So I have to give it up for Diani and director Emily Lou. Here they have cinematic evidence of sufficient wit and inventive moxie to handle a bigger budget. 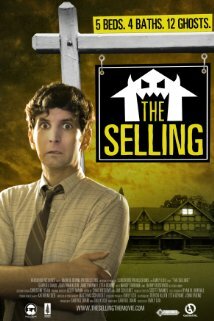 The Selling never tries to be anything more than a sweet, amusing and somewhat corny contemporary haunted house flick. And it more than meets that modest goal.